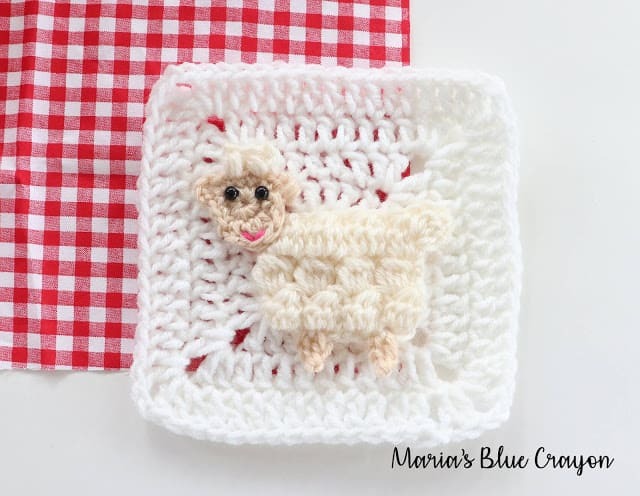 This crochet sheep granny square is a part of my Farm Blanket Crochet Along. Click here to see the main page of the crochet along. Find the patterns and video tutorials below. Don’t miss next week’s pattern for the crochet along! Sign up for my email list to get it right to your inbox when it’s up! *If you are not able to see the video above, you may need to disable your ad-blocker. Notes: Beginning chain does not count as a stitch. Ch 2, make a bobble on the side of the last bobble you just made to make the tail of the sheep. Fasten off and leave tail for sewing. Attach yarn to row 1 of body skipping the first stitch. *Ch 2, dc in next st, fasten off. Skip 2 st, attach yarn and repeat from * to make another leg. Round 2: Ch 1, sc, hdc, 2dc, hdc, sc, ch 4, sc in same sp as last sc, sc in next 4 st, ch 4, sc in same sp as last sc, sc in last st, join to first sc. Use E/3.5mm hook and attach off white color yarn to the top of the head between the ears (to the left of the right ear). Ch 2, popcorn st, sk 1, popcorn st in next, fasten off. Attach safety eyes and sew on nose with pink yarn and tapestry needle using the photo as a guide. Sew head onto body using photo as guide. Sew sheep onto white granny square. Lean how to Sew on Appliques to your granny square here! The video for the granny square is the same as the Christmas square EXCEPT use a J/6.00mm hook and fasten off after the 5th row.